Often times, caregivers or family members of elders feel guilty about leaving their loved one alone for the day. Self-Help for the Elderly offers an adult day care service that takes care of your loved one, so that you don’t have to worry anymore. This elder care service serves frail seniors and adults with physical impairments, mental impairments or dementia that cannot be alone for the duration of a day. They are provided with care and companionship as well as assistance and supervision during the day. The adult day care program allows family members or caregivers a few hours of relief during the day to go to work or fulfill other obligations. They can trust that their loved ones will be cared for and safe throughout the day. This program is meant to prevent seniors from being put in living facilities by providing alternative care. We strive to promote the social, emotional and physical well-being of our seniors, while helping them maintain or restore their essential functions. 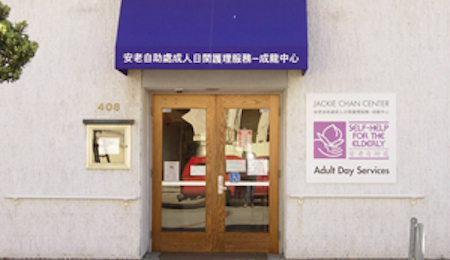 The adult day care facility is located at the Jackie Chan Center in San Francisco. We have a multi-disciplinary team that assesses the medical, psychological and functional status of each individual. Based on their specific needs and requirements, an individualized care plan is made for each participant. Our staff knows multiple languages to communicate with each participant. Languages include English, Vietnamese, Cantonese, Mandarin, Taishanese and other Chinese dialects. Our adult day care facility is licensed by the State Department of Public Health. Referrals for participants can come from home care services, hospitals, other healthcare professionals. Self-referral may be possible as well. To become a participant, individuals must first receive written approval from their primary care physician. Proof of tuberculosis clearance within the past 12 months is also a requirement. Medi-Cal covers the cost of day services for individuals that qualify. Private pay rates based on level of services needed are also available. For more information about the adult day care and to see if your loved one qualifies, contact Self-Help for the Elderly today.